"I've never seen my kids laugh that hard!" Mr. Magichead's recent Connecticut area appearances include June 16, 2018 for The Loomis Chaffee School, March 25, 2018 in Avon for Danny's 7th birthday, March 24, 2018 for Cub Scout Pack 170 Sandy Hook and March 12, 2018 in Ellington for a (4th appearance) preschool. 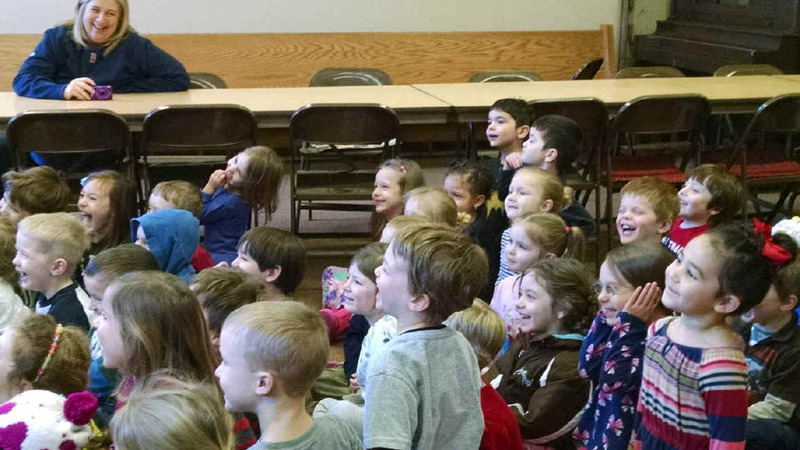 Other recent area appearances include March 3, 2018 for Avon Public Library in Avon CT.
"We really enjoyed it and all the kids had a great time!" "We appreciated the preparation and energy of your show." "We loved having you at our party...fantastic time!" Ask to arrange an amazing CT elementary school assembly magic show in Avon CT, Andover, Ashford and Ansonia. Bringing boffo bumbling and birthday magic shows to Bridgeport CT, Bridgewater and Brookfield, this magician says bye-bye to boring baptism and blue & gold banquet magic shows in Bethany CT, Burlington and Bolton. Beyond brilliant Branford CT, Bloomfield and Bethlehem magician for Bozrah CT, Berlin and Bethel magic shows. Breathtaking Barkhamsted CT, Beacon Falls and Bristol magic shows by the Brooklyn CT and Bantam area magician. Canterbury CT's coolest children's conjuror (magician) for company outings, Cub Scout, CT campground and corporate event magic shows. Children in Cornwall CT, Canton and Cromwell can count on the comedy magician coming to magic shows in Chester CT, Cheshire and Colebrook. A Canaan CT, Clinton and Columbia area magician for Colchester CT, Coventry and Chaplin magic shows. Delightfully dumfounding magician in Danbury CT, Darien and Derby area for magic shows in Deep River CT and Durham. Exciting egg (and rabbit) magic equals excellent kid's Easter and CT egg hunt entertainment. Energetic magician enjoys engagements for CT elementary school assembly magic shows in Easton CT, Essex and East Granby. Engage an Ellington CT, East Haddam and East Lyme magician for East Hampton CT, East Windsor and Enfield magic shows. Enjoy East Haven CT, East Hartford and Eastford magic shows. Finally a family function, first birthday and CT fun fest magician for fundraisers, first communion, fair and festival magic shows. Folks at funny family magic shows in Fairfield CT, Fenwick, Franklin and Farmington find it's fun to be fooled. Great magic shows in Greenwich CT, Guilford and Glastonbury gets this magician good gigs in Granby, Goshen Connecticut, Griswold and Groton. Have hilarious Halloween magic show hijinks in Hartford CT, Hebron and Harwinton by this magician in Haddam CT, Hampton, and Hartland. Kindergarten & keen kid's fest magician in Killingworth CT, Killingly and Kent. Loud laughter likely at loony library magic show in Lyme CT, Litchfield and Ledyard with this magician in Lebanon CT and Lisbon. Magician Mr. Magichead in Madison CT, Middlebury and Monroe makes magic shows in Marlborough CT, Milford and Middlefield. Maybe magic show merriment in Meriden CT, Middletown and Manchester with the master magician in Mansfield CT, Montville and Morris. Nifty nursery school magician near New Haven CT, New Canaan and Newtown nimbly navigates to magic shows in Norfolk CT, Norwalk and New Hartford. Need a nutty magician in North Stonington CT, New Fairfield and New Milford or a magic show in North Haven CT, North Branford and Newington? Natty Naugatuck CT, Norwich and North Canaan magician available for New London and New Britain kid's magic shows. Ovations for the magic show in Old Lyme CT, Orange and Old Saybrook or the magician in Oxford CT ought to be O. K.
Phenomenal Purim party magician performances in Prospect CT, Portland and Pomfret or premium preschool magic shows in Preston CT, Plainville and Plymouth by the popular Putnam CT and Plainfield area professional magician. Stupendous summer camp & spree day magic shows in Stamford CT, Stonington and Sherman sound swell to this kids magician in the Salisbury CT, Sharon and Simsbury area. Silly Salem CT, Suffield and Southbury area magician for South Windsor CT, Southington and Shelton magic shows. Seeking special Scotland CT, Seymour or Somers magic shows by the Stafford CT, Sprague and Sterling area magician? Seriously stupefying magic shows in Stonington CT and the Stratford area a specialty! Try terrific tricks for tots magician in Tolland CT, Trumbull, Thomaston, Thompson and Torrington magic shows. Unquestionably upbeat and unforgettable magician for Union CT, Vernon and Voluntown unusual magic shows. Want a witty wizard in Waterbury CT, West Hartford and Weston or a wacky magician for Westport CT, Wilton and Woodbridge kids magic show? Wholesome magician in Washington CT, Warren and Woodbury area for magic shows in Westbrook CT, Waterford and Wethersfield. Wonderously wild Woodstock CT, Windsor and Watertown kid's magician for Wallingford CT, Wolcott and Windsor Locks magic shows. Wonderfully with-it magician in Willington CT, Winchester and West Haven area for world-class kid's magic shows in Windham CT.